It seems that gamers aren’t the only ones fed up with DLC and costly online services. Crytek CEO Cevat Yerli said that he felt these premium services (think Activision and EA) were “milking customers to death” and that once his company has completed their contracts with boxed products, they will only produce free-to-play titles. Yerli spoke with Videogames.com during the final day of this year’s E3 conference. 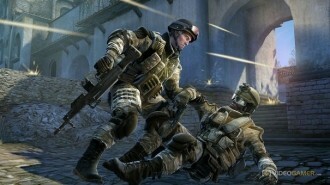 He told the publication that Warface will be the company’s first multiplayer FPS in the free-to-play category through their social gaming platform known as Gface. Yerli said he knew during their time developing console games that online and free-to-play was the future of gaming. He describes Crytek as going through a transitional phase from packaged goods to an entirely free-to-play experience and further iterates that all games and any new projects in the future will support this model. But if you are expecting junk titles, think again; all future games will have a triple-A production standard with budgets ranging from $10 million to $30 million. The interview didn’t touch on a couple of particularly important questions. With an online model, is it safe to say that Crytek is done producing single-player titles? If so, this could be a real letdown to gamers who aren’t fans of multiplayer or those who live in areas with limited Internet connectivity. Also, if Crytek plans to make games that cost upwards of $30 million but give them away for free, how do they plan to make a profit? Yerli already spoke out against DLC so it would seem unlikely that they would try and sell gamers additional in-game items. Perhaps the titles will be ad-supported? Or maybe they plan to charge users through Gface, which in itself would be a "paid online service."